Ilya Kaminsky was born in Odessa, former Soviet Union in 1977, and is now widely regarded as the most exciting young poet in America. In 1993, his family received asylum from the American government and came to the United States. Ilya received his BA from Georgetown University and subsequently became the youngest person ever to serve as George Bennet Fellow Writer in Residence at Phillips Exeter Academy. Dancing in Odessa is his first full length book. 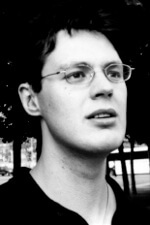 In 2005 alone, Ilya Kaminsky won Whiting Prize, the 2005 Metcalf Award from the American Academy of Arts and Letters, and the 2005 Foreword Poetry Book of the Year award. Ilya’s homepage is ilyakaminsky.com. A book review in The Adirondack Review.